We are pleased to welcome the National Youth Orchestra of Canada (NYO Canada) to campus between June 17 to July 30 for their summer training institute hosted in the Faculty of Music facilities. 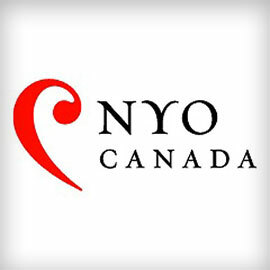 For more than fifty years, NYO Canada has enjoyed an iconic reputation as Canada’s orchestral finishing school providing the most comprehensive and in-depth training program available to our country’s best young classical musicians. Following their time at Laurier, the orchestra will travel cross-Canada to perform in some of Canada’s most prestigious concert halls. During their time in Waterloo, NYO Canada will host a series of faculty and students concerts in the Maureen Forrester Recital Hall and at the Kitchener-Waterloo Chamber Music Society. Many concerts are free or by donation. This concert will feature NYO Canada faculty members. This concert will feature NYO Canada student musicians. This concert will feature the Fermosa String Quartet. This concert will feature Oesterle (Carrousel), Gripp (String Quartet) and Higdon (Dark Wood). 9 p.m. to 10:30 p.m. Entry by donation, suggested $15 (free CD $20+).